Before :- Dipak Misra and N.V. Ramana, JJ. I.A. No. 6 of 2016 in Writ Petition(s) (Civil) Nos. 24 of 2016. D/d. 13.1.2016. Gupta, Zaffar Inayat, Ms. Anjali Sharma, Balraj Dewan, Ajit Sharma, P. Ramesh Kumar, Ms. Tara Narula, Ms. Tanima Kishore, Ms. Supriya Juneja, Purushottam Sharma Tripathi, Mukesh Kumar Singh, Nithya Rajehekar, Mihir Samson, Ravi Chandra Prakash, Ranvir Singh Chillar, Ajit Sharma, Bijan Ghosh, Advocates. For the Respondents :- M. Yogesh Kanna, Jayant Patel, Ravindra Keshavrao Adsure, Anand Landge, Sriram P., Vishnu Shankar Jain, Ms. Aditi Mohan, Ankur S. Kulkarni, M.Y. Deshmukh, Aniruddya Rajput (for M/s Lemax Lawyers & Co.), N. Rajaraman, Advocates. 2. The application for intervention stands allowed. 3. Apart from intervention, in the application there is also a prayer seeking vacation of the order of stay dated 12.01.2016 passed in the writ petition. It is contended in the application that the Jallikattu is not a fight between bulls and humans but a game where the participants are required to embrace the running bulls by hanging on to their hump as long as possible; and they are unarmed. It is also put forth that the bulls are trained not to let the village youth clamber on to their humps and in no case they are led away by the owners afterwards. 4. It is urged that Jallikattu is a socio-religious festival and not an entertainment and the people at various places in the State of Tamil Nadu have immense faith in the said festival for many a reason. Emphasis is laid on the culture of the State and the belief of the pastoral communities. In essence, it is urged that there is no cruelty meted out to the bulls in such a festival or game. 5. Mr. N. Rajaraman, learned counsel appearing for the applicant would submit that it is a 3000 years old tradition and this Court had never meant in Animal Welfare Board of India v. A. Nagaraja & Ors. [(2014) 7 SCC 547] that there should be ban on Jallikattu. It is urged by him that there was no justification or necessity to direct stay of the Notification issued by the Central Government on 07.01.2016 at the instance of the petitioners, for they do not have any idea about the cultural base of this Country. Learned counsel would submit that the age old culture of this country is perceivable in the villages but not in the metro cities where the representatives of the petitioners or the petitioners reside. "43. All animals are not anatomically designed to be performing animals. Bulls are basically Draught and Pack animals. they are live-stock used for farming and agriculture purposes, like ploughing, transportation etc. Bulls, it may be noted, have been recognized as Draught and Pack animals in the Prevention of Cruelty to Draught and Pack Animals Rules, 1965. Draught means an animal used for pulling heavy loads. Rules define large bullock to mean a bullock the weight of which exceeds 350 Kgs. Bullocks have a large abdomen and thorax and the entire body has a resemblance to a barrel shape, which limits ability to run. Bulls have also limitations on flexing joins and the rigid heavily built body and limited flexion of joints do not favour running faster. Due to that body constitution, the Prevention of Cruelty to Animals (Transportation of Animals on Foot) Rules, 2001, especially Rule 11 says that no person shall use a whip or a stick in order to force the animal to walk or to hasten the pace of their walk. Bulls, it may be noted, are cloven footed (two digits) animals and two digits in each leg can comfortably bear weight only when they are walking, not running. Horse, on the other hand, is a solid hoofed plant-eating quadruped with a flowing mane and tail, domesticated for riding and as a draught animal. Horse power, we call it as an imperial unit of power, equal to 550 foot-pounds per second. Horse's anatomy enables it to make use of speed and can be usefully used for horse racing etc., unlike Bulls. (ii) as a performing animal, any animal which the Central Government may, by notification in the official gazette, specify as an animal which shall not be exhibited or trained as a performing animal." "8. The State of Tamil Nadu has also taken up the stand that every effort shall be made to see that bulls are not subjected to any cruelty so as to violate the provisions of the PCA Act and the sport event can be regulated as per the provisions of the TNRJ Act. 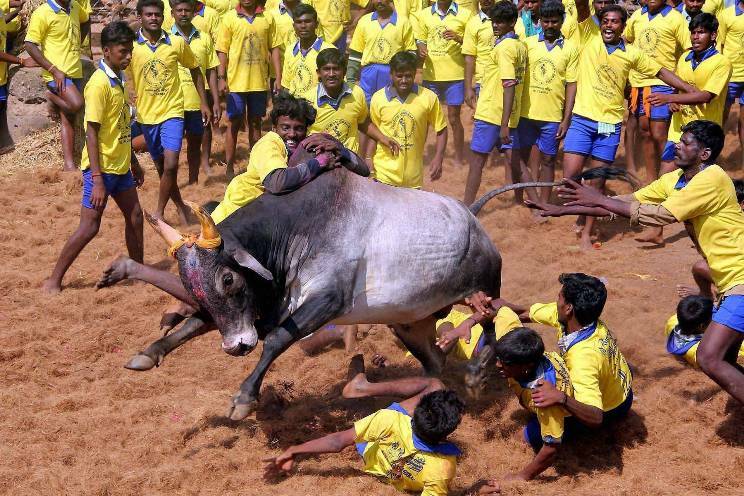 Further, it was also pointed out that the bulls taking part in the Jallikattu, Bullock-cart Race etc. are specifically identified, trained, nourished for the purpose of the said sport event and owners of Bulls spend considerable money for training, maintenance and upkeep of the bulls." "36. We will now examine whether the second limb of Section 3 which casts a duty on the person in-charge or care of animal to prevent the infliction upon an animal, unnecessary pain or suffering, discharges that duty. Considerations, which are relevant to determine whether the suffering is unnecessary, include whether the suffering could have reasonably been avoided or reduced, whether the conduct which caused the suffering was in compliance with any relevant enactment. Another aspect to be examined is whether the conduct causing the suffering was for a legitimate purpose, such as, the purpose for benefiting the animals or the purpose of protecting a person, property or another animal etc. Duty is to prevent the infliction of unnecessary pain or suffering, meaning thereby, no right is conferred to inflict necessary/unnecessary pain or suffering on the animals. By organizing Jallikattu and Bullock-cart race, the organizers are not preventing the infliction of unnecessary pain or suffering, but they are inflicting pain and suffering on the bulls, which they are legally obliged to prevent. Section 3 is a preventive provision casting no right on the organizers, but only duties and obligations. Section 3, as already indicated, confers corresponding rights on the animals as against the persons in-charge or care, as well as AWBI, to ensure their well-being and be not inflicted with any unnecessary pain or suffering. Jallikattu or Bullock-cart race, from the point of the animals, is not an event ensuring their well-being or an event meant to prevent the infliction of unnecessary pain or suffering, on the contrary, it is an event against their well-being and causes unnecessary pain and suffering on them. Hence, the two limbs of Section 3 of PCA Act have been violated while conducting Jallikattu and Bullock-cart race." "42. Sections 3 and 11, as already indicated, therefore, confer no right on the organisers of Jallikattu or bullock-cart race, but only duties, responsibilities and obligations, but confer corresponding rights on animals. Sections 3, 11(1)(a) & (o) and other related provisions have to be understood and read along with Article 51A(g) of the Constitution which cast fundamental duties on every citizen to have "compassion for living creatures". Parliament, by incorporating Article 51A(g), has again reiterated and re-emphasised the fundamental duties on human beings towards every living creature, which evidently takes in bulls as well. All living creatures have inherent dignity and a right to live peacefully and right to protect their well-being which encompasses protection from beating, kicking, over-driving, over-loading, tortures, pain and suffering etc. Human life, we often say, is not like animal existence, a view having anthropocentric bias, forgetting the fact that animals have also got intrinsic worth and value. Section 3 of the PCA Act has acknowledged those rights and the said section along with Section 11 cast a duty on persons having charge or care of animals to take reasonable measures to ensure well- being of the animals and to prevent infliction of unnecessary pain and suffering." 9. The aforesaid paragraphs clearly show that the Jallikattu and other form of bulls race cause trouble, pains and stress to the bulls and it is contrary to the provisions of the Act. Be it be ingeminated that the Court has adjudged the issue in the backdrop of Article 51(a)(g) and (h) of the Constitution of India. There can be no shadow or trace of doubt that the Constitution of India is an Organic and Compassionate Constitution. 10. Learned counsel for the applicant has drawn our attention to paragraph 91 to show that there was no prohibition or ban but to regulate the game. On the contrary, Mr. Sundaram and Mr. Grover, learned senior counsel, would submit that apposite reading of paragraph 91 does not reflect so. We had noted the said submission yesterday and we will be dealing with the same at the time of final hearing. 11. Learned counsel for the applicant would submit that certain arrangements have already been made and responsible District Collectors have been appointed to supervise Jallikattu, and therefore, so the order of stay passed by this Court should be vacated. The aforesaid submission leaves us unimpressed, for the simon pure reason, the two-Judge Bench of this Court, as it appears, had discussed many facets with regard to Jallikattu and expressed its opinion. The arrangements made on the basis of the Notification would not warrant alteration of our order and, therefore, we are not inclined to vacate the order of stay. 12. Let the matter be listed on the date fixed. It is open to the applicant to file the counter affidavit within four weeks from today and assist the Court. Prevention of Cruelty to Animals Act, 1960, Sections 3 and 1 - Ban on Jalikattu - Notification issued by Central Govt. permitting use of bulls for Jallikattu - Supreme Court stayed the order - Vacation of order sought on the ground that certain arrangements have already been made and responsible District Collectors have been appointed to supervise Jallikattu - Contention not tenable :- The arrangement made on the basis of the Notification would not warrant alteration of stay order.